Scribbles done by construction workers left on the walls of the "Outlying Island Line 4 Pylon" office, standing in a forbidden area of Yamijima. 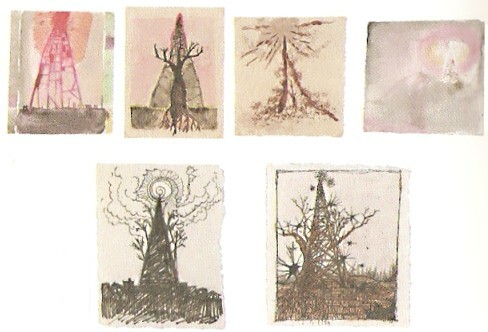 They all have the same base theme, "a pylon, towering high in the sky, merged with a huge tree". As mentioned in the description of archive [No.028] Harbour Worker's Journal, all of those who had relocated to Yamijima sensed a "strange creepiness" about the island. When several people drew the same eerie image of a tower simultaneously, the feeling of unease most likely increased between those connected, an incident too unnatural to call a simple coincidence. Maybe the workers vaguely sensed that they had committed a sin in building the pylon on the peak of Mt. Shinari, originally a place which was forbidden from behind entered. Further, if you think of the tower's construction as "challenging the will of god", you may be able to consider the pylon built on Yamijima to be a projection of the Tower of Babel as mentioned in chapter 11 of the Book of Genesis in the Old Testament of the Bible. The digital camera of Mamoru Itsuki, burning with ambition at his first big job as apprentice in the editing department of a magazine. This "self-shot", taken before heading off on research, is quite an important one. In the background of the photo are a fisherman - later "Shibito Edo" - and Yuri Kishida. 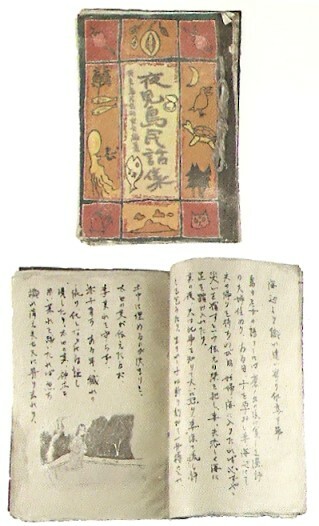 Taking someone to open the "seven seals" on Yamijima and merge with Mother is the role of the dove (Yuri Kishida). At this moment, Yuri is leading fisherman Edo back to Yamijima with her. However after arriving on the island the fisherman dies in an unforseen accident (falling onto a rocky area and hitting his head), so Yuri changes her target to Mamoru Itsuki. 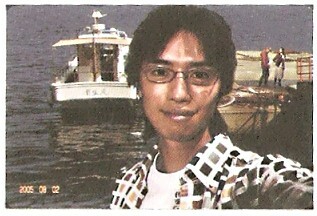 Also, the boat shown behind Itsuki is the Shoseimaru. You can see this if you look losely at the name on the boat's stern, but the characters are blurry, so you read it as "Hanumaru". This is a play by the staff.